Everyday parents post endless questions on social media parenting sites asking questions about sleep, nightwaking, nightfeeding and how to help their baby sleep longer. Everyone has an opinion and everyone is an expert. Here’s a few facts about babies and sleep. I work with hundreds of babies every year. Yes, babies have small stomachs and need milk frequently throughout the night, like every two to three hours. But this is in the first few weeks of life. Not months. It is normal for any baby to be able to stretch to a chunk of longer sleep of 4-5-6-7 hours by about 6, 7, 8,9 weeks of age. They will feed every 3 to 4 hours once past the first few weeks of life most of the day. Sometimes there is a two hourly feed. Babies of any age never need continuous hourly or two hourly feeding, if your baby does this means that they are simply snacking and not having a complete feed. There is a difference to this and ‘demand feeding’. There are reasons for a baby wanting two hourly feeds and one can be sucking to sleep a sleep strategy that can easily be changed in a matter of days not months. Teaching your baby to self settle is not only one of the best things you as a parent can do for yourself but it is wonderful for your baby. Life is so much easier for your baby when they are able to relax, calm, close their eyes whenever they are tired and sleep anywhere without having to wait until you are available. Only a parent who has helped their baby to learn to self settle knows the benefits to their precious baby and to themselves so they will encourage you. Whereas a parent who has never known this easy, gentle way to fall asleep has no knowledge of calm self settling. Helping your baby to learn to self settle doesn’t involve a ‘cry it out’ strategy, there are many gentle tips that are quite amazing to use and your baby will understand and relax and sleep. Babies at six months of age who are waking continuously at night say every two hours or for a handful of feeds are not sleeping well and will not thrive. They certainly will cope and get by but it is really helpful if a parent gains some advice as to why and learns how to help their baby. This is not a selfish parent but rather a concerned parent. Self settling is not a myth that is unattainable. Sleeping long chunks at night is not unattainable either. 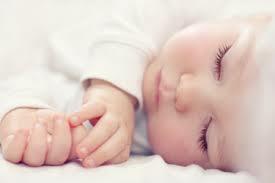 Once a baby learns how to relax and calmly go to sleep whenever they need to, they sleep well, deeply and restfully. Then I always see babies go through development leaps whether it be chatting, rolling, crawling or standing immediately after they learn how to fall asleep easily. Best of all they are happy and calm. Just like we are when we sleep well.